2005- Fiction perfect for preschool and elementary age kids. Resources: http://www.liveoakmedia.com/client/guides/9486X.pdf for ideas on discussions starters with kids and other activity guides. There’s also vocabulary words and internet activities here. From the jacket: This is the diary…of a spider. But don’t be worried—he’s more scared of you and your gigantic shoe! Actually, he’s a lot like you. He goes to gym class and has Grandparents Day at school. But he also spins sticky webs, scales walls, and takes wind-catching lessons. Lucky for him, his best friend is a fly! Doreen Cronin and Harry Bliss, the team behind the #1 New York Times best-selling Diary of a Worm, spin a hilarious tale about the upside-down web world of an eight-legged charmer and his unlikely friend, Fly. Why I love it: From the photo album inside cover to the speech and thought bubbles on the illustrations, this book had me smiling real wide. For an example; the post card from Grampa was addressed to Spider on 5 Web Ave. Arachnidville, USA, and had a French gnat leg scotch-taped to the back as a delicious present for Spider, his grandson the narrator and main character. The text was definitely stand alone, and when the illustrator made his art stand alone beside it, Diary of a Spider was the best thing that happened to me all day. It was so special I immediately re-read it for that fun feeling of being tickled again and again. For more books with resources please visit Perfect Picture Books at Susanna Leonard Hill’s blog.. You can also click on the Perfect Picture Book Badge on the right side bar and it will travel through cyber space to the resource page on Susanna’s blog. Happy reading! Would you read this book? Why or why not? 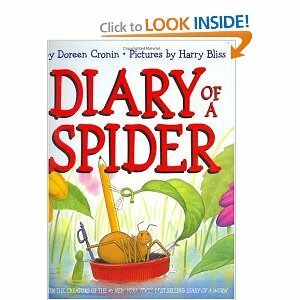 This entry was posted in blogging, Clara Bowman-Jahn, Clarike Bowman-Jahn, Course or Book Review, social networking and tagged "Diary of a Spider", book review, Doreen Cronin, Harry Bliss, Perfect Picture Book Friday, Picture book, Susanna Leonard Hill. Bookmark the permalink. Your enthusiastic review sure makes me want to read this clever, fun tale, Clar! It’s on the TBR when I get to an anglophone library, list! I am not a fan of spiders, but I must say your review of this book captivated me! It sounds like a hilarious book. And, I loved your response to the book. I was chuckling with what you shared. Must get this one. Thanks. 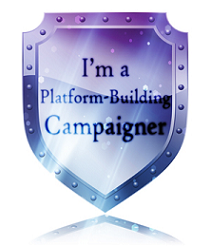 It’s a great choice for PPB. I love this book! Great review (and PPBF)! Did you know that there is a “Diary of a Fly”? I would definitely want to read it thanks to your great review! You really bring these books to life for us–thanks so much! You’re very welcome, I loved reading this book and hope you will like as much as I did. I had seen this title for a while, but never bothered to take a look. After reading your review I will have to go get it now. Thanks for posting. Yes. I love humorous books with fun illustrations. What a great review! I need to read this. I adored Diary of a Fly. OH! You’ll adore this, too. Guarenteed! Now I normally don’t like spiders, but this sounds like a fun book. Will look out for it in my local library, hope they have it …. *fingers crossed*… Thanks Clar. The library should have it. IF not and you really did want to read it, you could get a hold on it and an interlibrary loan. I’ve been known to do that. Quite frequently actually. My kids get so freaked out by spiders, that I think this is a must read family book for all of them- even my 10 year old! Welcome to my blog, Tracy, and thanks for commenting. I went to you blog and enjoyed what I found there. I have both this book and Diary of a Worm on request at the library, so I’m glad to see they’re worth reading.